While the topic of Net Neutrality has been one of the hottest debates of the last year, I have remained mostly silent. I had wanted to compile my thoughts as completely as possible before commenting since the issue is very complex. When it comes to the subject of Net Neutrality, I could write a book. In fact, I probably will one day soon. But for now, events unfolding have made expressing my thoughts on the topic much more urgent and I can not wait any longer. While I have tried to condense my thoughts, the following post is a little long. However, if you want a thorough understanding of the Net Neutrality debate, please read, share, and comment below. My relationship with the Internet is a unique one. I lived the whole of my childhood never having heard of the Internet. Yet I’ve spent my entire adult life growing up along with it. I’m just old enough to know what it is like to have grown up without the Internet but just young enough (and techie enough) to have embraced it as an integral part of my life. I am an Internet “colonist” if you will. For me personally, the Internet has transformed me as much as it has transformed society. My adult life and my career have been inextricably intertwined with the evolution of the Internet into mainstream society. As a student of technology, history, and liberty, I regard the Internet entering the mainstream as a watershed development in the history of mankind. This time in history will be regarded as a pivotal era in the evolution of human civilization. Sure, I enjoy cute kitten videos as much as the next guy, but to me the Internet is much more than entertainment. I see the Internet as the greatest tool for freedom mankind has ever known and one of the greatest entrepreneurial engines in history. If technology is one of the highest forms of human expression, then the Internet is the greatest medium for that expression ever created. So believe me when I say I value the openness and freedom of the Internet as much as anybody and will do everything I can to protect it. The term “Net Neutrality” was coined way back in 2003 by Columbia University media law professor Tim Wu, so it should be obvious that the issue is not new. I personally have been following the subject for many years and actually had experience with some of the precursor issues back in the late 1990’s. Net Neutrality has received a lot of mainstream attention in the last year so it suddenly has moved to the forefront of techno-political conversation. A big problem for those wishing to understand the discussion is that the concept of “Net Neutrality” is simultaneously both complicated and simple. The term can mean different things to different people and most people really don’t have any clue of the underlying technology or politics. Shallow soundbites and buzzwords tend to oversimplify the subject. So allow me to quickly break it down – and don’t skip ahead because understanding the underlying issues is critical in understanding the debate at large. I think that for most people, Net Neutrality is the idea that Internet Service Providers stay “neutral” when it comes to delivering the content you are accessing. For example, an Internet provider should not be able to block or throttle data coming to you from a company like Netflix. But to many it also means that they should not be able to block data that is politically sensitive or information that may be controversial. I can’t imagine anyone wanting their choices restricted. I would assume that if given a preference, most people would say they want the freedom to read or watch anything on the Internet and not have the quality of their service arbitrarily degraded. Incidentally, I think most people would also say the same thing about TV and radio service, if they had the choice. So who could possibly be against Net Neutrality? Obviously the big communication companies that provide Internet service are always looking for ways to increase their revenues. One way that has seen some interest is the idea of “paid prioritization” where Internet providers can prioritize traffic coming from certain sites. For example, Netflix could pay various ISPs to ensure that their streaming video data had prioritization on the network so that users could have the best viewing experience possible. In a legally regulated Net Neutral scenario, ISPs couldn’t do this and therefore would lose out on potential revenue. It should be obvious that ISPs would rather not be restricted by rules that limit revenue. Therein lies the debate as far as most people are concerned. They believe it is simply an issue of keeping the Internet free and open for everyone vs the profit of large communication companies. Now these people aren’t exactly wrong. But they are not getting the whole truth. Most proponents of Net Neutrality want the government to be able to intervene and enforce rules that would prohibit ISPs from implementing paid prioritization. How exactly this should be done depends on who is proposing the rules, but regardless they all revolve around government controlling the ISPs. Most opponents of Net Neutrality say they don’t want the government to get involved and that Internet service providers aren’t truly interested in creating Internet slow lanes to extract payments out of Internet content companies. They say the Internet is already neutral and government regulation will only stifle the openness of the Internet as well as investment and growth of Internet technologies. As I’ve discovered in many things political, both sides actually want the same thing – in this case a free and open Internet. Of course, both sides differ in the way they want that achieved. And unfortunately when arguing the issue, each side paints the other with a broad brush. Net Neutrality proponents claim that all Internet providers want to set up paid prioritization schemes so that they can control what you are able to access in a way similar to how cable TV subscription packages work today. Internet providers are only interested in profit and they could care less about Internet freedom. Net Neutrality opponents claim that Internet providers have no interest in restricting access to particular content and would self-regulate so that they would never use their position as last-mile provider to extort money from businesses that provide content. Net Neutrality proponents are only interested in stifling profits as a way to punish rich companies. Obviously, neither exaggeration is correct. But what both sides miss are some fundamental understanding of the way Internet service works and the politics around it. Those who know me or read this blog would probably assume that I would fall on the side of less government involvement. However, it isn’t that simple. Let me be clear on one thing: I do NOT want Internet service providers making decisions for me on what type of content I can view or restricting the free flow of any type of information that I want. This is something I would fight tooth-and-nail against. But I am also fearful of government doing the exact same thing! Does it really matter if it is a corporation or a government restricting my free and open Internet? Neither is something I want and I assume most people would agree with me. However, very few people are talking about the danger of giving the federal government control over Internet Service Providers which essentially gives them control over the Internet itself. 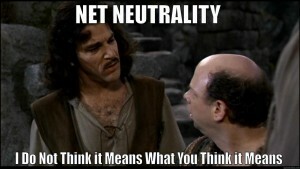 As someone who believes in the free market, Net Neutrality is a tricky subject. Instinctively I know that government regulation can’t truly help the situation. But in the same breath, I also don’t trust the big Internet service providers. I really have no doubt that big ISPs would follow the paid prioritization model if they felt it would be profitable. Would they use their position as the last-mile provider to exploit Internet content companies? That isn’t as clear, but for argument’s sake I can make the assumption. With this bleak scenario in my head, what besides government intervention can stop big ISPs from wrecking the free and open Internet? The answer is clear: competition. But when it comes to the current state of Internet providers, that isn’t the whole answer. Competition is ultimately what gives consumers the power in any free market. A company that does unpopular things to consumers will lose business to other companies that don’t do unpopular things. The threat of collusion is greatly diminished the more competition there is. The profit motive tends to incentivize companies to outflank their competition rather than colluding to keep the status quo. But something is missing when it comes to competition in today’s Internet provider market. There seems to be a distinct lack of it. And therein lies the rub. People complain about Internet service providers like they do about cable TV or phone companies. Which isn’t surprising because most ISPs are in fact cable or phone companies. For all the complaining done about these companies, the problem is that people feel trapped. Many people feel like they don’t have a choice. What is it about cable and phone companies that make people feel that these businesses have so much power over them? That really is the question to ponder. Nobody likes to feel like they are being controlled. Regardless if it is big business or big government, people do not want outside entries dictating what they can or can’t do or what information they have access to. No one wants feel trapped because they can’t leave the influence of an entity that wants to control them. I’ve thought about this question for quite awhile. This is the key to the Net Neutrality debate and it seems like no one is discussing it. The reason cable and telephone companies have such control over the people they serve is because their infrastructure is under the protection of a government-sanctioned monopoly. Cable and telephone companies do not need to worry about competition from other cable or telephone companies because local governments make it illegal for competitors to exist in their jurisdiction! Instead of adding more government regulation to fix problems created by government regulation in the first place, we should attempt to repeal that regulation which is causing the problem! Since there is so little competition in the Internet provider market it is feasible that companies could leverage their power to increase revenue at the expense of a free and open Internet. Nobody seems to want that to happen but the problem exists because of past government action, not the lack of it. However, most Net Neutrality proponents are only calling for more government intervention so the idea of Net Neutrality seems married to increased regulation. The arguments from Net Neutrality proponents are very emphatic that big Internet providers will eventually conspire to lock us into the type of subscription options that exist today for cable TV. Again, I actually somewhat agree with this assertion. I don’t trust the big Internet providers to always do the right thing. However, I definitely don’t trust big government to always act in the best interest of the people. Net Neutrality proponents rarely discuss the danger of big government to the very Internet they claim to hold dear. The main thrust for most “Net Neutrality” proponents isn’t so much an actually neutral Internet, but rather that we entrust the Internet service provider market to government. And the main counterpoint by Net Neutrality opponents isn’t that a neutral Internet is a bad thing, but rather that government regulation is. Therefore it is this “Government Regulation of Internet Providers”, or as I now simply deem, GRIP, that is the actual sticking point. Everyone seems to want a free and open Internet, we all just disagree on how to best ensure that. Proponents of GRIP use terms like “fast and slow lanes” to describe what they think Internet providers will eventually offer to subscribers. As I said before, in no way do I want this type of Internet service. I want exactly what I have now, which is a high-speed connection that is not traffic-shaped or prioritized to the detriment of any site or service I wish to access. I believe this is also what most people want as well, which is why any threat to free access of any site or service on the Internet is met with such resistance. People want freedom and the Internet is the greatest tool of freedom the world has ever seen. So it is not surprising that when people are told that large Internet providers have plans to restrict their freedom that they would look to government to stop this from happening. The Internet service provider industry by-and-large reject the idea of GRIP because they claim that it will stifle investment and growth of the Internet. Honestly, I could care less about such arguments, except when it comes to continued improvement of bandwidth and access. I’m not sure why the ISP industry chooses to hang their hat on this argument because the optics play out like they are greedy bastards, more concerned with profit than anything else. Instead, they should be focusing on the real specter of GRIP: the fact that once the government can regulate the Internet service provider industry, they can regulate the Internet itself. The very thing that people are up in arms about regarding “Net Neutrality” is exactly why they should fear GRIP. If they believe competing companies will collude to restrict the freedom of the Internet, I’m not sure why they think that a government with enormous power wouldn’t be corrupted to do the same thing. The only difference, and the key factor to understand, is that competing companies in a free market answer to their customers whereas a government bureaucracy effectively answers to no one. It is much easier to fire your ISP than it is to root out layer upon layer of bureaucracy – especially when most of those bureaucrats are unelected – we can’t simply vote them out! 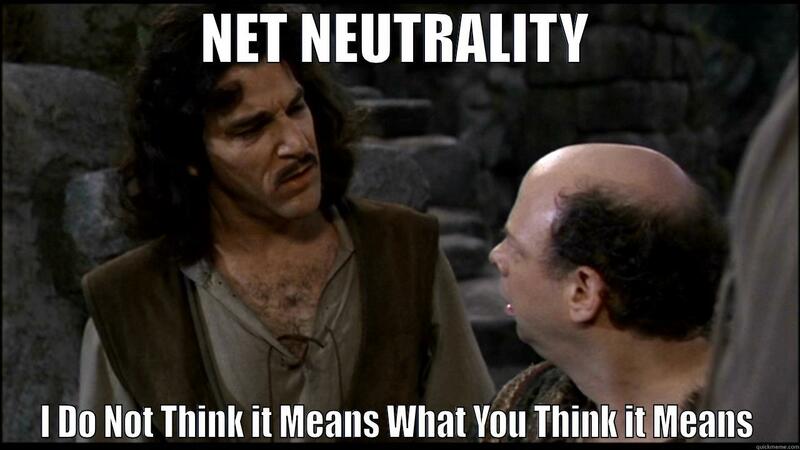 Another issue that proponents of GRIP rarely mention is that we actually currently enjoy Net Neutrality! Yes, without the FCC interfering, after about 20 years of mostly unregulated service, our Internet service is not throttled by any major Internet providers. Yes, there have been examples of companies attempting to mess around with the data transmitted over their infrastructure, but the customer backlash was quick and fierce and those companies promptly backed down. While proponents of GRIP try to use these incidents as proof of the big, bad wolf trying to blow down your free and open Internet, I look at these situations as examples of why we don’t need the government to get involved. We the people exert plenty of pressure on the ISPs to provide the type of service we want. We simply do not need a so-called government solution to a problem that does not exist! What we need is more competition and the solution is to remove the government-created barriers that restrict all existing and future communication companies from competing with each other in local markets. We are actually very lucky that cable companies have their roots in TV and phone companies in telecommunications because governments allowed both entities to exist since they served different markets. The reality is that now cable and phone companies actually offer virtually identical services: Internet, TV, and phone. There is virtually no difference in the services they provide, other than the infrastructure in which they arrive at your house or business. This should make one thing very clear: there is truly no need for governments to sanction monopolies to communication companies anymore. If two providers can exist in an area, why not three or more? When it comes to Net Neutrality, competition is the prevention and cure to any company restricting the freedom of the Internet. It is time to create more competition, not continue to cripple it. At best GRIP is a solution looking for a problem. At worst, GRIP is a calculated attempt by big government proponents, including big business, to begin government regulation of the Internet so they can exploit it later. Be certain about this point – big business is a big fan of GRIP. Those who support GRIP under the guise of Net Neutrality are basically handing control of the Internet to the very interests they claim to fear. Just a quick study of the recent repeated attempts at Internet regulation (SOPA, PIPA, CISPA) should indicate that powerful entities abound that wish to regulate the Internet. Of course, they couch this regulation under the guise of protecting copyrights or national security, neglecting to acknowledge the privacy infringements these laws would cause. GRIP, under the guise of “Net Neutrality”, is potentially even more insidious. Once government has control of the Internet Service Provider market, it is not a stretch to believe their control will overflow. Today’s proposed rules are ostensibly for the protection of the consumer. Tomorrow’s regulations could be to “protect” copyright holders or to give the NSA access to your private data. Make no mistake about it, whatever bad things a corporation could do to your Internet pales in comparison to what big government can do. How sad would it be for proponents of Net Neutrality to wake up to a future where their worst nightmares have come true – but not because of greedy corporations – but because they turned over control of the Internet to the only entity actually capable of restricting it? Let me leave you with this final thought: the history and legacy of the FCC is control and censorship. If you believe the FCC will ultimately do anything different with the Internet, I know a Nigerian prince with millions of dollars ready to transfer to your bank account.